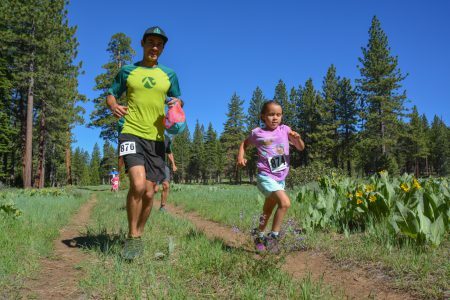 The Burton Creek Trail Runs are part of the Tahoe Trail Running Series put on by Big Blue Adventure and include three distances which appeal to all abilities on the running spectrum – 6K, 12K and a Half Marathon. This year, Burton Creek took place on Father’s Day. I had signed up to run the half marathon about two weeks prior to the event, completely forgetting that it was indeed Father’s Day (minus 10 points for me on the good wife scorecard). Luckily for me, it doesn’t take much arm-twisting to make these sorts of things family affairs and my husband (Abe), father-in-law (Jim) and six year old daughter (Sawyer) all decided to participate as well by running the 6K. My morning started bright and early at 5:00AM for the usual pre-race necessities – food, caffeine and bathroom visits being the three primary keys to a good day. Considering that the 6K didn’t start until 8:30am whereas the half started at 7:30, I had arranged to carpool to the start with my friend, Tiffany, so my husband and daughter could sleep in a bit more. This proved entirely unnecessary as Sawyer woke up at about 5:30 rearing to go. It worked out well though since it gave Tiffany and I a chance to catch up on the drive from Truckee to Tahoe City and allowed Abe and Sawyer to have a daddy-daughter morning on Father’s Day. Right at 7:30 the go signal was given and we were off. Tiffany and I ran together for all of sixty seconds, during which she declared that she was going to see how she felt at mile 8 and then decide to take off or not. Once sixty seconds hit, she took off and I knew there was no way I could keep pace with her for the duration of the race so I resolved to settle in and find my own pace instead. The first half-mile of the course is a climb at about a 5% grade – nothing crazy, but enough to get my heart pumping especially with race jitters fueling a faster than normal start pace. From there, we descended for about a half-mile and then started a solid one-mile climb. This is where the crowd started to spread out a bit and the dust settled underfoot. I was immediately surprised about the condition of the trails. A lot of the trails in our area took a beating this past winter, also known to locals as SNOWMAGEDDON, but not these trails. This course is run primarily on what, during the winter, are cross-country skiing trails. I’m not sure if they just suffered less abuse or if trail maintenance fairies (read very hard working trail maintenance crews) worked their magic to clear trees, remove obstacles and clear rocks and ruts. Either way, I was very excited to worry a bit less about rolling an ankle than I have been on other courses throughout the spring and enabled me to take in a bit more of the scenery. 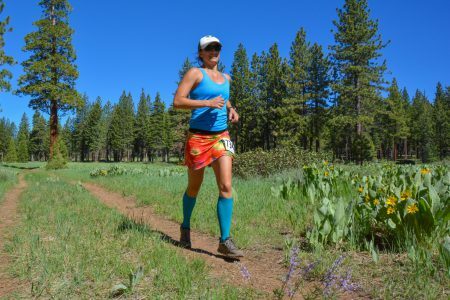 Along those lines, the middle six miles of the race were made up of gentle rolling hills, all on either single track or buffed out x-country skiing trails. These miles flew by and showcased towering pines, massive granite boulders, an assortment of wildflowers and the occasional, filtered view of beautiful Lake Tahoe. There was even about a half-mile of the course that still had some snow (all runnable) covering the single track. Right at 8:30AM or when I was about 5.8 miles into the race, I knew the rest of my family would be starting theirs. I couldn’t wait to hear Sawyer tell me all about her race. We didn’t quite know how long it would take her and guessed about an hour and a half. I had mom-visions of hitting the timing just right and we could finish our respective races at the same time. At about 7.8 miles into the race, there was a short out-and-back resulting in very muddy three-quarters of a mile. I’m guessing this was added to the course to ensure that 13.1 miles was indeed the length of the course, but at the end of the day, I’d venture to say this wasn’t needed. Nonetheless, I actually like out-and-back segments – it’s fun to see who’s ahead of me and by how far as well as to give props and shout outs to fellow runners on course (even if they don’t acknowledge you because they’re too engrossed in whatever distraction their headphones are providing – note to self: resist the temptation to shout “BEAR” just to see if they’ll remove headphones for that). Alrighty then – having the “easy, cruiser” miles done, it was time to pay attention to my feet again. At 8.2 miles in to the race, I started a nice descent that lasted for about 2.5 miles and provided an opportunity to pick up the pace and just let gravity take me. I was cruising and feeling pretty comfortable here still checking out the beauty that surrounds these trails. Then BAM – I reached the bottom of the hill on what I now know is Burton Creek Sate Park Road and was faced with a hill wall in front of me. 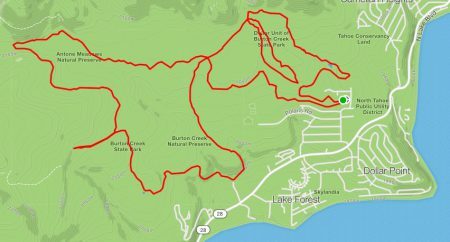 The first half-mile of this hill ranges from a 6% grade to a 15.5% grade: in writing this report and looking at the map, this section of trail is aptly named “Judge Judy”. Yeah well, Judge Judy was tough but I actually found it to be really fun at this point in the race. The hill continued for about another one and a half miles, albeit at a more “gentle” grade ranging from 2%-8%ish. Finally, I crested the hill at mile 11.5 and started the final descent into the finish. Sawyer smoked our expectations and she finished her first 6K, at 6 years old in 59:12. It turns out she was also the youngest participant overall. More importantly, she ran the whole race and crossed the finish line with her daddy and grandpa on Father’s Day.